Passive smoking is the involuntary inhalation of smoke released by other smokers. The risks of passive smoking are less in comparison to those who actively smoke, however, harm can still be done. Passive smoking is a form of domestic pollution and possibly the most harmful. In the UK, passive smoking is estimated to be responsible for 3000 deaths in people aged 20 - 65 and 8000 deaths in those over 65 years of age. The effects of passive smoking on our health depends on the duration and the intensity of exposure to the smoke. 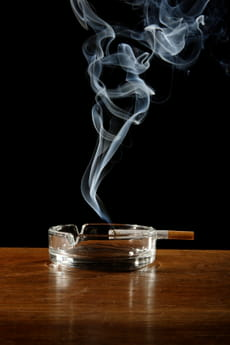 The effects are the same as for a smoker - mainly cancer, deterioration of lung function and heart disease. Cot death is more likely. Children when exposed to passive smoking are more likely to become a smoker themselves when older. Chronic lung conditions and cancer are more likely when older. Increases the risk of a cardiac incident by 25% . Increases the risk of developing lung cancer by 25% . Are twice as likely to have a stroke (CVA). No-smoking policies in public places has had a direct impact on reducing the emergency admissions for heart attack threats in Italy by 11% and by 17% in Scotland. A drop of 2.4% in emergency hospital admissions for heart attack admissions. There was a 5.5% decline in smoking after the ban with approximately 400,000 quitting as a result of the ban. The International Union Against Cancer (UICC) launched in February 2008 a campaign aimed at protecting children from passive smoking. It is estimated that some 700 million children, "almost half of the world's youth", are subjected to passive smoking. The main objective of this campaign is to promote a more responsible attitude from smokers lighting up in confined spaces, such as at home or in the car and in the presence of children . Under the slogan "I love my smoke-free childhood", associations send seven advisory messages to parents, with the aim to protect their children. BEFORE ANY SURGICAL OPERATION. Smoking increasing the risk of postoperative complications including cardiac, respiratory and deep vien thrombosis problems and also wound healing. It is advised to reduce stop smoking or considerably cut down 6 weeks before the operation, which will help reduce the complications related to smoking. Latest update on February 5, 2011 at 09:08 AM by Janey39. This document, titled "Passive smoking," is available under the Creative Commons license. Any copy, reuse, or modification of the content should be sufficiently credited to CCM Health (health.ccm.net).